An intense thunderstorm blew through Davidson Thursday afternoon around 5:30, with winds that sent the rain sideways and knocked down trees and power lines. 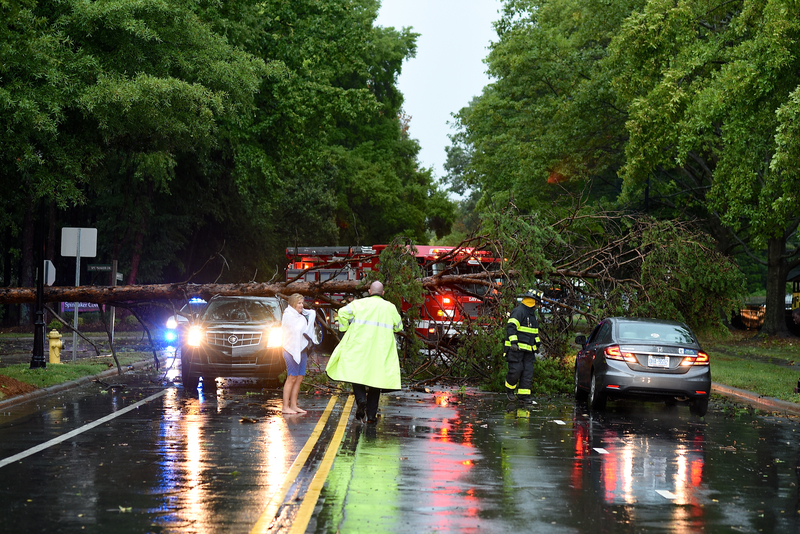 Firefighters handled a flurry of calls, from a tree that fell onto cars on Griffith Street, near Davidson Day School, to a lightning strike that brought a fire scare at 230 Catawba Ave.
Fire and Medic were called to wrecks on I-77 at Exit 28, and to North Main Street, at Depot Street. Utility lines were down on Pinecrest Street at Ridgewood Avenue. Neighbors also reported trees down on North Downing Street, in the McConnell neighborhood, and some parts of town lost power. We vaguely heard about the Davidson storm issues on a radio traffic report and said “Gee, we’d know all the details if only…..” Thanks for the post David; you read our minds and once again, provided a great service in sharing information. As I told another friend: another special guest appearance. I made the mistake of turning on the scanner when the storm hit. Clearly I am still recovering.